Major resistance gene to rhynchosporium, Rrs18, maps close to the telomere on the short arm of chromosome 6H in barley. Rhynchosporium or barley scald caused by a fungal pathogen Rhynchosporium commune is one of the most destructive and economically important diseases of barley in the world. 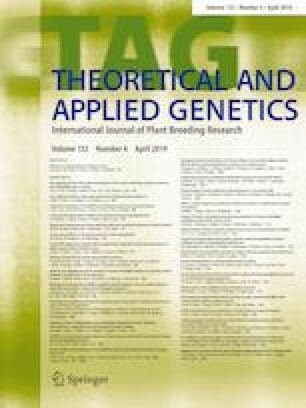 Testing of Steptoe × Morex and CIho 3515 × Alexis doubled haploid populations has revealed a large effect QTL for resistance to R. commune close to the telomere on the short arm of chromosome 6H, present in both populations. Mapping markers flanking the QTL from both populations onto the 2017 Morex genome assembly revealed a rhynchosporium resistance locus independent of Rrs13 that we named Rrs18. The causal gene was fine mapped to an interval of 660 Kb using Steptoe × Morex backcross 1 S2 and S3 lines with molecular markers developed from Steptoe exome capture variant calling. Sequencing RNA from CIho 3515 and Alexis revealed that only 4 genes within the Rrs18 interval were transcribed in leaf tissue with a serine/threonine protein kinase being the most likely candidate for Rrs18. The online version of this article ( https://doi.org/10.1007/s00122-018-3262-8) contains supplementary material, which is available to authorized users. This work was funded by the Scottish Food Security Alliance (SFSA) and the Bavarian State Ministry of Food, Agriculture and Forestry. MB, LR, RW, MEL and AA were supported by the Scottish Government Rural and Environment Science and Analytical Services (RESAS). AA and MB were also funded by the BBSRC-CIRC Project BB/J019569/1. KH was supported by the Federal Office of Agriculture and Food (BLE) under Grant No 28-1-41.009-06.